If you are due for a vacation and you want a place where you can combine history, shopping, sports, and family bonding activities, La Porte Texas is where you should go. 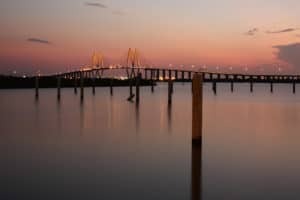 Less than an hour’s drive from Houston, this city by the bay is perfect for an active but relaxing break. La Porte is a place with history; it was the site of the Battle of San Jacinto in 1836, the battle which established Texas as a republic independent from Mexico. You can trace the trail of this battle as you walk along the San Jacinto State Historical Park. From the park you can enter the San Jacinto Museum of History, a place where children can learn about Texas history in interesting ways. La Porte has a total of 22 parks and recreation facilities; these include bicycle and hiking trails for some adventurous outdoor exercise. For some serious stretching, you have 12 miles of trails that go through several parks, down to Sylvan Beach, and the La Porte Fitness and Recreation Center. Kids especially enjoy the city’s 350,000 gallon wave pool, and golfers will feel right at home in the Bay Forest Golf Course. This beautiful bayside golf haven has earned the reputation of being one of the top 20 golf courses in the Lone Star State. 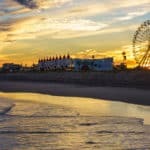 There is something for everyone in La Porte, and you better believe that something special in this city is waiting for you. Continue to read our Visit La Porte TX Travel and start planning your vacation to La Porte today. For a list of the best beaches in Texas, visit here. 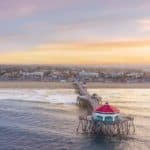 The best time to visit La Porte is October to November or March to April when the weather is warm, but not sweltering, and accommodation prices are reasonable. Winter is the best time to score a deal on your accommodations, but it will likely be too chilly to enjoy La Porte’s beach activities. The months that span May and September constitute La Porte’s long summer season, where lodging rates, tourism and temps are at their peak. This 32 acre Harris County park is the perfect place to get away from the hustle of city life and experience a nice beach with a refreshing ocean breeze. 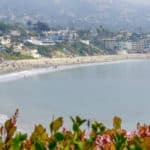 Unlike other beaches in the area, Sylvan Beach boasts fine sand, no seaweed covering the beach, and smaller waves for more enjoyable swimming. Sylvan Beach Park contains not only a playground for children, but clean benches and picnic tables, a fishing pier, boat ramp, and an air-conditioned pavilion. Bring a picnic for lunch and spend the whole day at the beach. For just $4, head out to the pier and fish all afternoon. In 1836, Texian troops surprised the Mexican army camped here. Shouting “Remember the Alamo” and “Remember Goliad,” the rebels routed the larger force in only 18 minutes. Walk in their footsteps, explore the museum, and enjoy a bird’s-eye view from the top of the monument. Spend a few hours or an entire day exploring the San Jacinto Battleground complex, including Battleship Texas. Bring a group or come on your own. Plan a picnic; we have picnic tables and grills, and a picnic pavilion for your group. You can also hike, geocache, and nature watch. The San Jacinto Museum of History is housed in the base of the San Jacinto Monument. The Museum is operated by the San Jacinto Museum of History Association — a non-profit organization — in association with the Texas State Parks and Wildlife Commission. More than just a gateway to a great view, the Museum is your gateway to Texas culture! It was established not only to honor those who fought here in 1836, but also to re-visualize the history of Texas and the Spanish Southwest. It was created as a steward of history, and to promote friendship between Texas, Mexico, Spain, France and Latin America. The Baytown Nature Center is located in Baytown, Texas, 20 miles east of Houston. It is located on a 450-acre peninsula along the Houston Ship Channel and surrounded on three sides by Burnet Bay, Crystal Bay, and Scott Bay. Your Sailing Adventure Aboard Sailaway cat is designed to provide you with a unique sailing adventure that is relaxing and enjoyable and can be designed to meet your specific requirements. The duration of a cruise can be from two to four hours. You are welcome to take part in the sailing of the vessel or you can just sit back relax and enjoy the sound of the wind and water. …choose your own adventure…Sailaway cat can provide it all. For more information call +1 832-392-8312, or visit them on the web at Sailaway Clear Lake Charters. Half day and full day fishing adventures and private boat rides available, come spend a day on the water while visiting Kemah TX! For more information call +1 281-383-0505, or visit them on the web at Get the Net Fishing Charters. Sail aboard the 55′ schooner Capt Kidd on Galveston Bay. Departing from Seabrook Texas and the Seabrook Marina the ship sails past the Boardwalk in Kemah and out to open waters on Galveston Bay. Bring your own drinks and snacks on the scheduled 2 hour public sails and relax as the capt and crew do all the work for you. For more information call +1 281-334-5433, or visit them on the web at Captain Kidd. Spend The Night Aboard The Battleship TEXAS!That’s right. You and a group of friends can actually spend the night aboard this huge Battleship. Sleep where the actual sailors who lived on her bunked down for the night. Battleship Texas was commissioned in 1914 and is the only surviving US Navy ship to have served in both WW I and WW II. The Battleship Texas become the Nations first Battleship museum on 21 April 1948. For more information call +1 281-479-2431, or visit them on the web at Battleship Texas Historic Site. Folks visiting the greater Houston area are encouraged to take a journey with us on a Kayak or Stand Up Paddleboard. We hope that visitors, as well as the people who live in the area, come and enjoy this gorgeous area quietly tucked away between Houston and the Gulf Coast. For more information call +1 713-510-7968, or visit them on the web at Pinky’s Kayak Rental. One of the well-loved hallmarks of this popular Monument Inn Restaurant is the remarkable views of the Houston ship channel. While enjoying your meal there is a great view out our second story windows of the international ships are constantly sailing into or out of port. Specializing in Fresh Gulf Coast Seafood and offering a wide array of Steaks, Chicken and Pasta Dishes, Monument Inn serves up Houston’s tastiest waterfront dining. For more information call +1 281-479-1521, or visit them on the web at Monument Inn. Enjoy casual fine dining, local artistry, and a luxurious bar stocked with your favorite wines and our signature cocktails. – in La Porte. Based upon their deep-rooted principles of good service, high-quality cuisine and excellent value, this fine dining contemporary grill was designed and built with you, the customer, in mind. For more information call +1 281-470-8484, or visit them on the web at Main 101 Grill & Bar. The Kitchen was born in 2011 in the city of La Porte, in the great state of Texas. After dining for years in other local restaurants and steakhouses that served prepackaged and reheated processed food, they decided to open a restaurant that would cook food the way it used to be done. They take great pride in preparing all their fresh food from scratch, just like Grandma used to make. For more information call +1 281-867-9231, or visit them on the web at The Southern Komfort Kitchen. Their brick fired pizza, great burgers and a good selection of American food favorites make them a local favorite. They also offer an Early Dining Menu for those looking to save a few dollars. Pipeline Grill is also a great venue for Happy Hour with a great selection of craft beers and specialty frozen drinks! For more information call +1 281-470-0141, or visit them on the web at Pipeline Grill. Brutally awesome no-holds-barred burgers. 100% beef freshly pounded to perfection, right there where you can see it. Hand-stuffed tacos. Hand-spun shakes. Hard-earned swagger. Melty cheese. Lavish veggies. Thick-sliced bacon. And their famous Libre sauce. You can have fries and a taco with every burger. Their signature Skeleto tacos: sublimely-seasoned little treasures in a slightly crunchy shell. For more information call +1 281-941-4305, or visit them on the web at Burger Libre. 941-9584, or visit them on the web at Man Kind Sports Bar. If you like neighborhood bars, outside eclectic seating, and fun friendly people… this is your spot! It’s worth a trip to La Porte for a nice day out. Decent beer choices, fun games, pool table, and bands that play there. Very cool biker bar. For more information call +1 281- 471-6366, or visit them on Facebook at Neon Moon Saloon. A local favorite place to hang out and relax and have awesome, sophisticated cocktails. Their drink menu is always changing and keeps things fresh. The people there are so nice and really know their stuff. They also have really good options for beer and wine. You can also have food delivered to you and make it a dinner out with delicious cocktails. For more information call +1 832-224-4182, or visit them on the web at Rosewater. Down to earth, bar with a great selection of music and a great DJ. I love when a DJ believes in his playlist enough to dance and enjoy his own vibe. If you are looking for a nice, laid back, friendly atmosphere try this place. For more information call +1 281-471-2256, or visit them on Facebook at Shacks Club & Pub. This is an island-inspired craft cocktail lounge featuring small plates. This bar is very friendly, on point and helpful with a great atmosphere. For more information call +1 281-549-4080, or visit them on Facebook at Volcano Room. Drive to an array of attractions and dining options from our Hampton Inn & Suites La Porte. Close to the beach, lakes and Galveston Bay, water activities are always a favorite. Explore the Kemah Boardwalk with restaurants on the water and exciting rides, less than 20 minutes from our hotel. Learn about space and the NASA program at the Houston Space Center. With spacious rooms and suites, homelike amenities and friendly service, you’ll feel comfortable right away. For more information, pricing, or to reserve your room visit Hampton Inn & Suites La Porte. 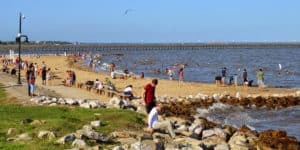 Situated on Galveston Bay, this quiet city combines down-home charm with a modern influence from nearby Houston to create a unique, friendly community. 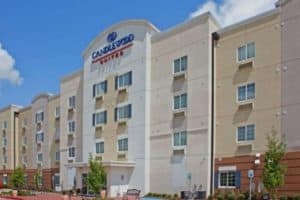 The Candlewood Suites La Porte hotel provides a welcoming environment close to Kemah Boardwalk and NASA Space Center. 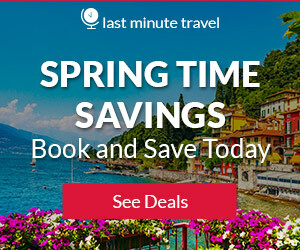 For more information, pricing, or to reserve your room visit Candlewood Suites La Porte. 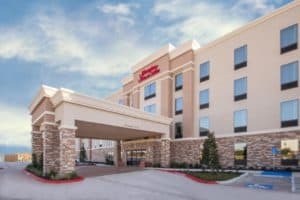 The La Quinta Inn La Porte is conveniently located just 25 minutes east of downtown Houston in the heart of the oil refining industry. Located at the intersection of Highway 146 South and Fairmont Parkway. 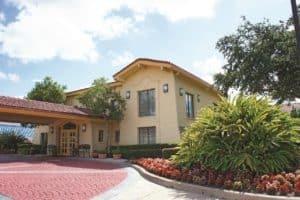 They are nestled near popular attractions such as: Kemah Boardwalk, Royal Purple Raceway, Pasadena Convention Center, George R. Brown Convention Center, Nasa Johnson Space Center, and Barbours Cut Terminal. For more information, pricing, or to reserve your room visit La Quinta Inn Houston La Porte. 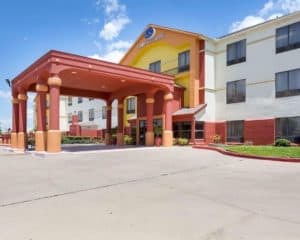 This hotel is located off Highway 146 and is within a 5-minute drive of La Porte. The hotel features an outdoor pool and suites with free Wi-Fi. Comfort Suites La Porte suites include a microwave and refrigerator, for light meals or late night snacks. Guests at the Comfort Suites are provided with a breakfast buffet. After breakfast, guests can work out in the gym or relax in the hot tub. A managers reception including wine, beer and appetizers is held on weekday evenings. For more information, pricing, or to reserve your room visit Comfort Suites La Porte. 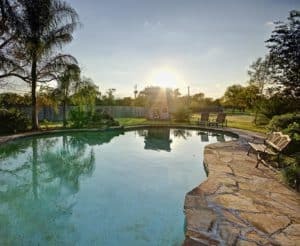 Wyman House Bed & Breakfast is an excellent accommodation choice to stay in La Porte. It features housekeeping and ironing service as well as a baggage storage, a designated place for smoking and parking. The rooms in Wyman House Bed & Breakfast are fitted with a laptop-size safe, a balcony, a seating area, a writing desk and ironing facilities. Guests can make use of a bathtub, a roll in shower and a bidet. For more information, pricing, or to reserve your room visit Wyman House Bed & Breakfast. I’ve never been to Texas but now that I’m closer than I was in New York, I will eventually get there. What better place to be than on the beach there,right? La Porte looks very inviting and a place I would definitely see in Texas! I’m used to the beautiful beaches here in Florida but I would love to see La Porte since you say so many great things about it! I loved the video about Sylvan beach! Does it get crowded there? It does get crowded during Spring Break. Do not head there during Spring Break. I know here in Clearwater spring break seems to last about 3 months, ugh. It is not the case in Texas. Just skip the month of spring break and you will be good 🙂 Thanks for visiting La Porte TX Travel Rob. Hi Leahrae,After reading your article and listening to your video, it would be nice to visit La Porte (Texas). As a fishing lover, I am very pleased with the large dock where fishermen can enjoy the activity. I live in Argentina and recently visited New York and Miami we had a great time with the family. Every hotel I have listed ( and all hotels in La Porte ) are basically situated very close to each other and near the fishing pier. So you can stay at any of my top suggestions and be close. La Porte is not a huge town anyway, so it will be easy 🙂 Thanks for visiting my La Porte TX Travel guide. I will visit here on my next vacation, is such an historic sight, I can’t wait to spend the night in that huge battleship, and Visit the monument inn, you shared so much good views about it, I can’t wait to visit there with my husband. Thank you for sharing this. You are welcome and you will have a great time staying on the battleship! Definitely a unique experience! For the best vacation site, La Porte TX is the place to make history to happen. They are experts when it comes to beach destination. LaPorte Texas is a place of history as it serves as the center where Texas gain liberty from Mexico in 1836. For the lovers of history and relaxation at the same time, this is the place to be. The battle ship is what I really have wanted to see in La Porte. Because yeah I would love to spend a night with my buddies in real life battle ship. That is what I call an ultimate vacation, and one never to forget any time soon. I am so intrigued and ready to start planning my vacation to La Porte! I think my wife will enjoy this as well. Thanks for the great information! You are so welcome Charles, and yes that is a unique experience, one that will last a lifetime. Then you get the whole beautiful La Porte community and the wonderful beaches. Can’t be beat for sure. Please let me know if you need any additional information. La porte Texas sounds like an amazing place in the U.S. I have added it to my list of awesome places to visit when I visit America. I’m a lover of seaside views and the cool sea breeze that blows over your skin, and dipping my toes in the sand. I am a beach lover and this is my kind of vacation. Thanks for the great information, and love your site! Texas is amazing, and I am just a tad biased being from Texas and all. I agree that beach travel, is the best type of vacation to take, hands down. I am glad you enjoyed visiting beach travel destinations. Excellent job. Makes me want to go and just sit on the beach and dangle my toes in the water. You offer a great deal of information on the area and history that makes it very inviting. We are planning a trip from California to the east coast in the future and this would be a wonderful place to visit. Yes Winslow, this is a great beach destination to visit, but then I love Texas 🙂 I am glad you enjoyed and thank you for visiting beach travel destinations. Your article is very interesting and informative. So much historical relevance surrounding La Porte. 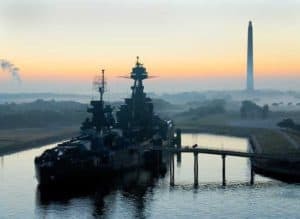 I can’t deny that the opportunity to spend a night on The Battleship Texas sounds highly appealing being that it’s the only US Navy ship to have survived both world wars. I’ll surely pen this down in my bucket list. Thanks for the article. You are very welcome Louis. Glad you enjoyed reading my La Porte TX Travel guide. Stop by again. You know, I had never thought of Texas as a beach destination before. I mean, I did know they are coastal and have beaches, but I always imagine people going to California, Florida, or South Carolina for beach vacations. You have opened my eyes to Texas’s potential. I have not spent much time in Texas before, but La Porte sounds like an excellent destination for family travel. I have lived in Texas for 10 years, and to be honest, I hadn’t thought of Texas as having “exceptional” beaches either. But there are quite a few, and Texans will attest to how wonderful they are! I like La Porte. It is outside of Houston, which is really not my kind of town and close to Galveston and Padre Island – both with great beaches. Certainly, your post is very interesting and beautiful, and the history gives it another aspect of interest for people like me that want to know something about the places we visit. For sure I want to go there on vacation. I am glad that La Porte sounds like a place you want to vacation to 🙂 Please let me know if you need any more information. This one of my dreams to be travelling into this kind of place.Very nice and relaxing.Thanks for this informative article of yours. Awesome! The La Porte TX Travel seems to be a fantastic place to visit. I have put it on my bucket list for my next holiday. I love history, so this is perfect for me. I must show this article to my husband, I am sure he will like it too. Thank you for this excellent post! Great Daniella, and La Porte has a lot of Texas history. It’s a small beach community, but definitely worth the visit. Thanks for stopping by! La Porte looks a very interesting place for vacation but also for travelers who want to explore and be active. Given the variety of prices, everyone can find something for themselves. I love history and I want to explore La Porte.Thanks for great post. You are very welcome Maja. I love Texas, but I am a little partial as I lived there for many years. I think you would love visiting this great little beach community. Thanks for reading! I’m so glad I came across your post today! We are going down to Houston in March to visit our son. And this location looks like a great day trip. Living in Alberta, Canada, not only do we look forward to the warmth, but love to see the ocean. La Porte looks like it has it all, lol. Thanks for such a thorough review of the area. I’m bookmarking this for sure! You are very welcome Suzanne and La Porte is so close to Houston. Personally I like any area that is outside of Houston, LOL. Even Galveston is far nicer. Please let me know if you have any additional questions. Thanks for stopping by Suzanne.